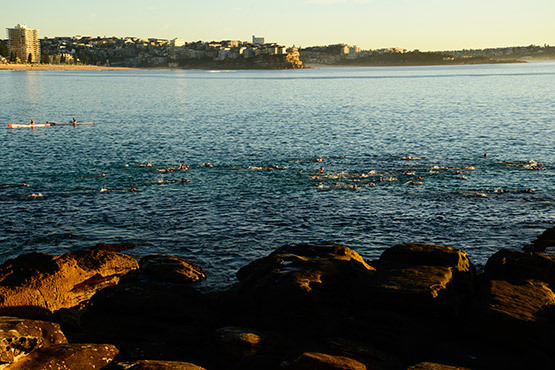 The Bold and Beautiful Swim Squad's 1.5km daily return swim from Manly Beach to Shelly Beach starts outside the Manly Surf Club and happens most days of the year. In order to see the start, you'll need to catch the first ferry of the day rom Circular Quay. Alternatively, you can catch the second ferry of the day andget there in time to see the return leg of the swim. 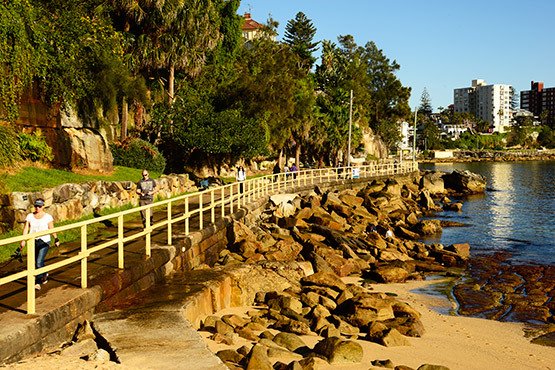 Here is a walk with a difference - not only do you enjoy a glorious Manly foreshore walk but you also get to experience a spectacle along the way. 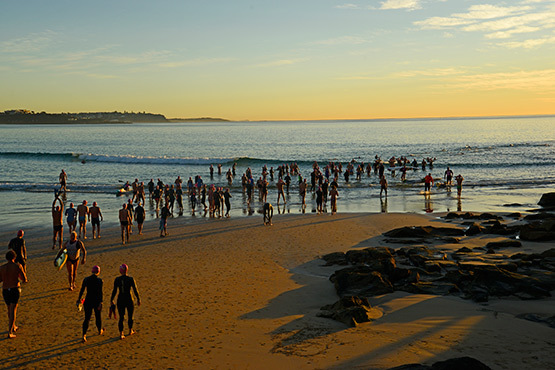 An enthusiastic group of swimmers gather outside the Manly Surf Club at 7am every morning to take part in what has become a ritual for 365 days of the year. Members of the Bold and the Beautiful Swim Squad mill around the surf club exchanging pleasantries before heading to the water and donning their distinctive pink caps for a 750-metre swim to Shelly Beach where, after a five or 10-minute breather and a bit more social banter, they dive back into the Tasman Sea and return to Manly. But you don't need to be bold or beautiful, or able to swim, to take part in this spectacle. 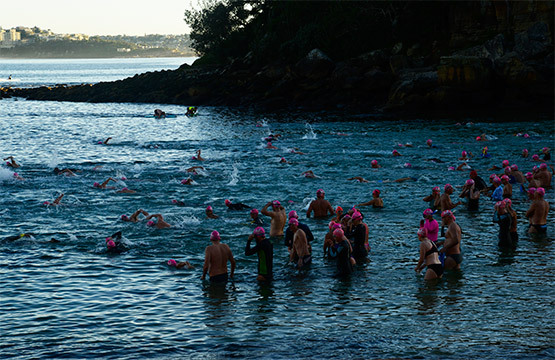 You can be part of the action by following the swim along the beautiful Shelly Beach walking path at a leisurely walking pace, keeping an eye on the swim but stopping to admire the expensive houses perched on the cliffs above the path. The swim takes about 15-20 minutes each way and the men and women who make the journey each morning are young and old and of varying physiques. It seems that having a pot belly doesn't mean you can't swim the 1.5-kilometre distance each morning. There are no St John Ambulance members in attendance so you quickly realise these are all superbly fit individuals. As the swim begins the sea swallows up up to 200 swimmers in what looks like the thrashings of a school of fish. The "school" quickly disappears around the point. The walk is an easy one, mostly on level gradings, and you are able to follow the swimmers the whole of gthe way while taking in the mesmerising sea vistas. 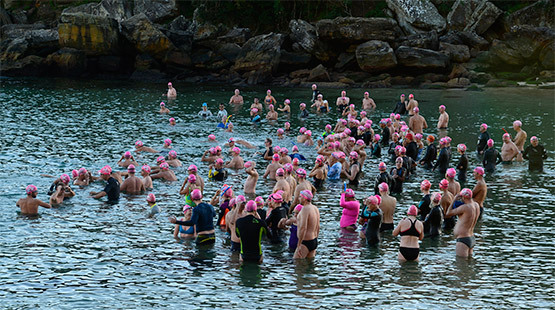 It's not long before the swimmers reach tiny Shelly Beach. One rises out of the water, followed by another, and the numbers standing in the shallows continue to grow until soon even the stragglers have emerged from the water. A fierce social chat is quickly underway and you can't help wondering if the talk is about the strength of the current, the water temperature or what each person has planned for later that day. For a short time courtesies are extended - courtesies that involve standing and engaging in idle talk so as to allow lesser swimmers a chance to get their breath back - but soon the serious mermans and mermaids are anxious to to return to the water and power their way back to Manly. The others follow suit and soon the beach is again devoid of human presence. 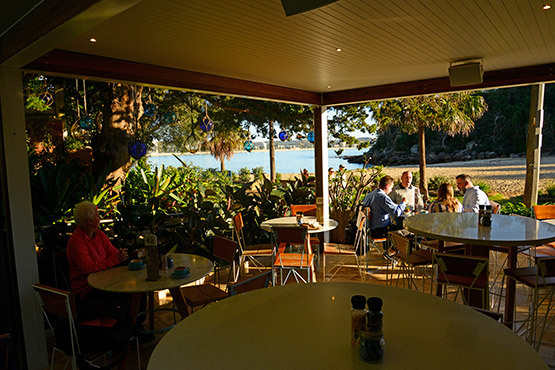 Cabbage Tree Bay is quiet, apart from the sounds of breakfast being served at The Boat Shed, a delightful cafe-restaurant a stone's throw from Shelly Beach. The Boat Shed is surprisingly busy at this time of the morning. It's barely 7.30am and seats are being snapped up by morning strollers and clifftop inhabitants who don't have to rush offf to work. 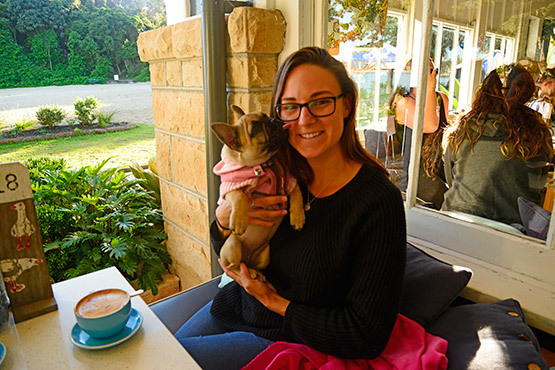 A schoolgirl lounges on a seat in front of a stylish gas-log open fire while her mother sips on a caffè latte. Businessmen discuss deals over breakfast while young women meet up for a for morning coffee before rushing off to the Circular Quay ferry. South of The Boat Shed a set of stairs leads up to a car park. 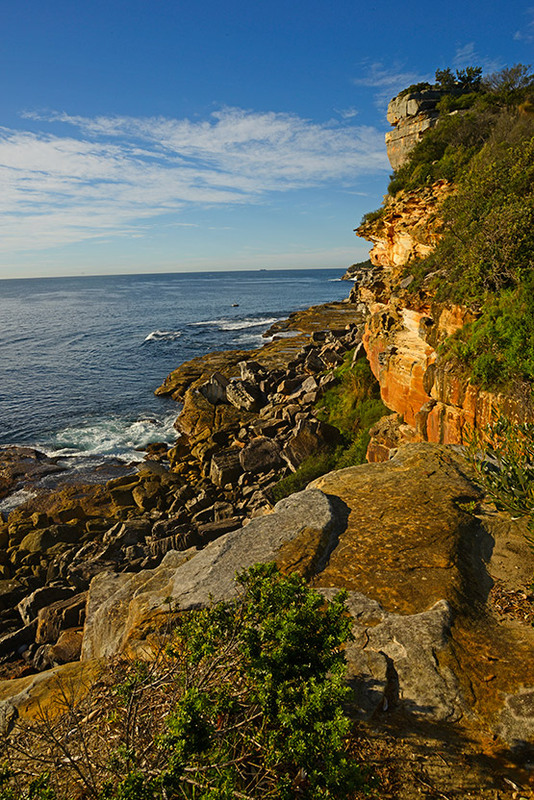 Here there are walking paths with vantage points that look out over the ocean and south to inspiring cliff formations. At one of the lookouts two women are taking instruction from a male personal trainer with a spectacular rocky cliff as a backdrop. 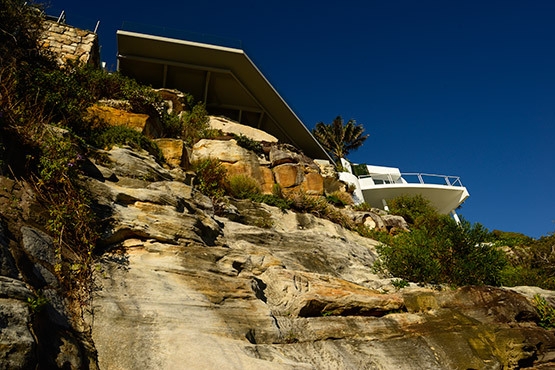 On the return journey to Manly you get to see Shelly Beach, the walking path and clifftop homes from an entirely new perspective. You're walking north with the sun in a different position, the light has changed and because you're no longer concenbtrating on swimmers in the water you see things you hadn't seen on the way over. A small cafe pops up on the walking path - blowed if I'd noticed that before! 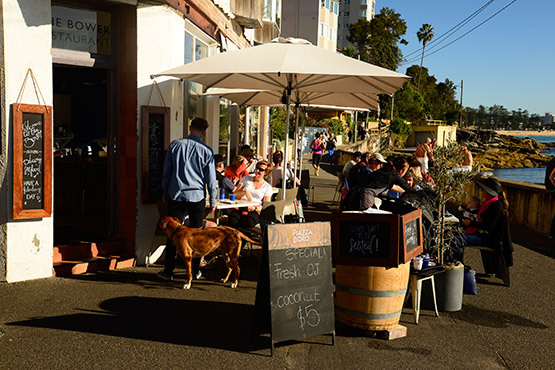 What's	more,	its sidewalk tables are	buzzing	with people. The walk back to Manly is delightful and you begin to notice how many people are now on the walking path. 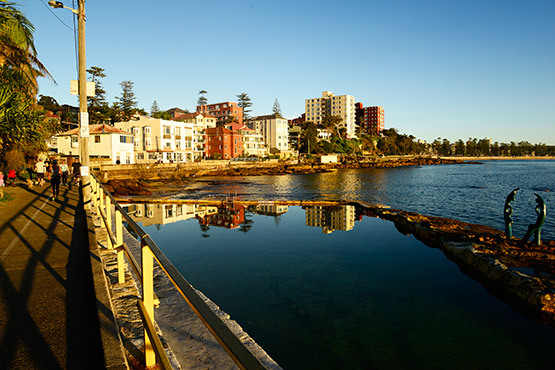 If you were lucky enough to live in Manly, it's hard to imagine not doing this walk each morning. You may not get the exhilaration the Bold and Beautiful get from their Herculean swims, but you couldn't help but return home with a big smile on your face. Catch the first Manly ferry departing Circular Quay at 5.30am. This ferry arrives at Manly Wharf at 6am. There is a 6.20am ferry but it doesn't arrive until 6.50am, which could mean that unless you hurry to the beach you may miss the start of the swim. 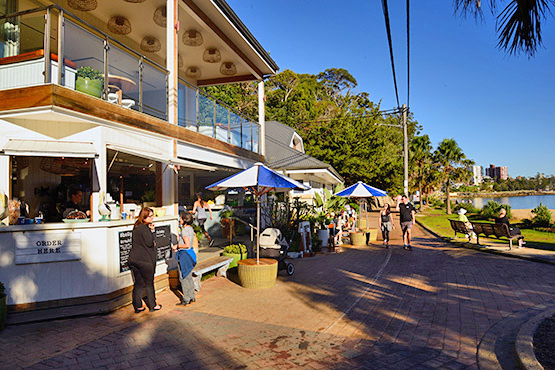 From Manly Wharf, walk down The Corso to the surf beach. At the beach, turn right and you will see the Manly Surf Club at the end of the beach.